You are here: Home / Brownies / You’ll Never Believe This Healthy Mug Brownie is Only 100 Calories! If you’ve ever counted calories, you’ll know you don’t get much food for 100 calories. All these foods work out at 100 calories each. If you’re sticking to a low-calorie diet, 100 calories can be a pretty big chunk of your daily allowance. And let me tell you, when you’re looking at 14 almonds in the palm of your hand, your 100-calorie snack can leave you feeling disheartened enough to throw them in the bin and call into the nearest Krispy Kreme. 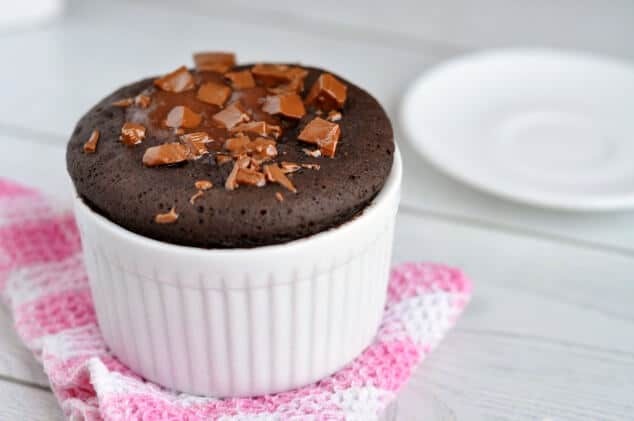 But instead of gorging on a 500-calorie donut and ruining all the hard work you’ve already invested in yourself, you can indulge in this healthy mug brownie without spoiling your mood or your calorie allowance! The actual calorie count will alter depending on the product brands you use. But it should never come in at more than 120 calories. And you can burn those extra 20 calories off by doing about 4 minutes of jumping jacks. Sorted! This healthy mug brownie was inspired by this skinny mug brownie for 1 recipe. It was my favourite healthy single-serving dessert for ages. And by looking at the comments, a lot of other people really liked it, too. It’s rich, it’s chocolatey and it’s low-calorie. What’s not to love? But in amongst all the happy brownie eaters were a few sad foodies complaining that the portion was too small. So I headed straight back to the kitchen and created this healthy mug brownie that’s double the size and practically half the calories! When trying to make the perfect healthy mug brownie, I lost count of how many recipes I’ve tried. It feels like I’ve tried every single recipe out there. And you know what the conclusion is? Mine’s the best. I don’t want to seem big headed, but it’s true. My healthy mug brownie is super-fudgy (thanks, yoghurt). It’s got a great chocolatey taste (all down to you, cocoa powder). And it’s low in calories (yay for zero-calorie sweeteners). But I’m all for trying new stuff. So if you think you’ve got a recipe for a better healthy brownie in a mug, leave it in the comments below. I’d love to give it a shot! I absolutely hate it when someone makes a healthy version of a popular comfort food by incorporating tiny amounts of really weird ingredients. You know what I mean. Like a chocolate chip cookie recipe that calls for 1/4 teaspoon of coconut oil. Or a paleo stir fry that needs a dash of coconut aminos. You end up left with a cupboard full of things that cost you a fortune but are never going to use again! The only ingredient you might not already have is a zero-calorie sweetener. But if you’re on a limited calorie diet, you should definitely get one. Life isn’t worth living without a little sweetness! You’ll also need a mug or a ramekin that holds at least 6oz. You could use the coffee mugs you have at home. But what happens when you want a mug of coffee and a healthy mug brownie? Get this set of 6oz ramekins so you can have the best of both worlds. Just 1 tablespoon of sugar contains around 50-60 calories. This healthy mug brownie keeps its calorie count so low by replacing all the sugar with zero-calorie sweetener. The type of sweetener you’ve got will change how much of it you want to use in the recipe. The key is to use the equivalent of 2 tablespoons of sugar. For example, Pyure Organic All-Purpose Blend Stevia Sweetener is twice as sweet as sugar. So you’d only need 1 tablespoon. It should say on the packet how sweet your zero-calorie sweetener is compared to regular sugar. So just do a little basic maths and you should be good to go. Or you can always look it up online. What an age we live in! A super-simple healthy mug brownie that takes just 60 seconds to make and is only 100 calories! It's deliciously fudgy and oh-so gooey in the middle. You'll love it! Stir all the ingredients together in a mug or ramekin that holds at least 6oz (these ramekins are perfect) until totally combined. Make sure there are no dry pockets left. 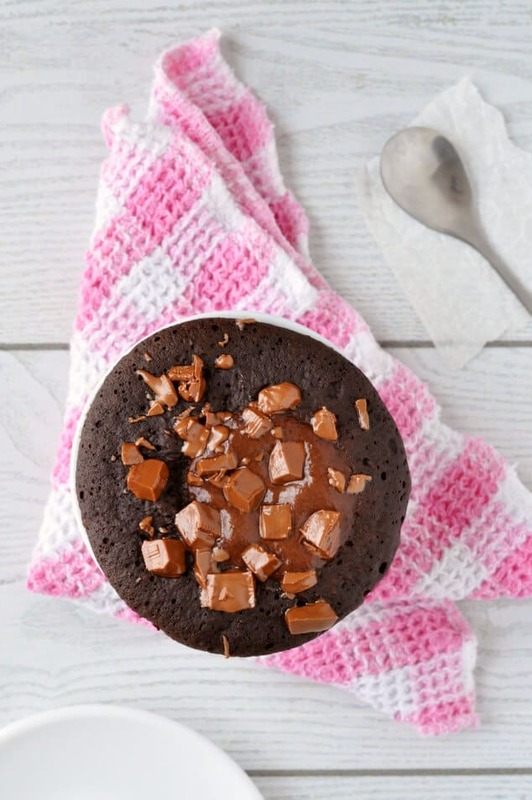 Place in the microwave and cook on full power for 45 seconds, until the outside of the brownie is springy to the touch but the centre is still a little wet. Enjoy straight away while warm. You can top your brownie with chocolate chips straight after it comes out the microwave. They'll melt and get wonderfully gooey after about 30 seconds. But 1 tablespoon of chocolate chips will also add 60 calories. It's your call! If you're making this healthy mug brownie on a low FODMAP diet, you need to be careful about the artificial sweetener, since most IBS sufferers struggle with them. You can replace the sweetener with 2 tablespoons of sugar, but this will add 100 calories. Can I also use normal sugar or sweetener like honey? If you’re going to use a different sweetener, I’d definitely recommend a solid over a liquid. So ‘yes’ to sugar and ‘no’ to honey. I’ve made this exact recipe with sugar before and it works out perfectly – albeit higher in calories! Ooo I am definitely trying this with coconut yogurt! 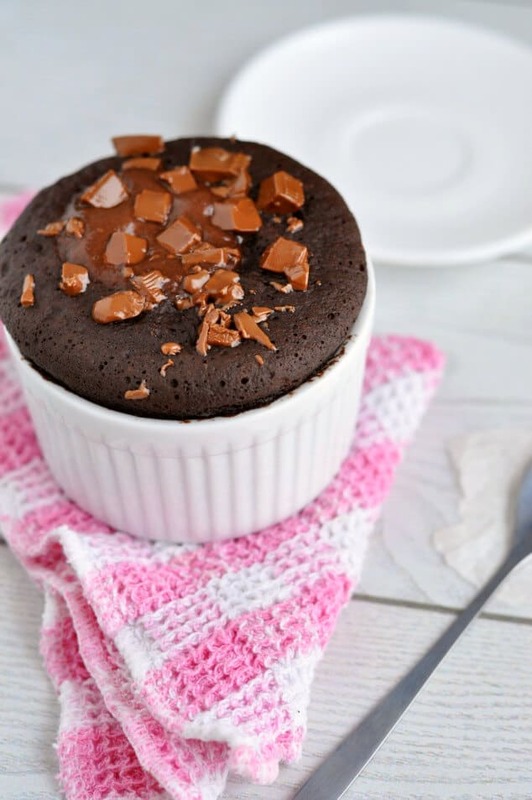 I’m a huge fan of mug cakes and I love finding ones that don’t need eggs! Would it be okay to top the brownie with ice cream instead? If yes, what flavor of ice cream do you recommend? You can use any flavour of ice cream you like – but it will definitely increase the calories! I will definitely try this one, but omiting the Truvia…..it is not a good sugar substitute. I use Stevia, and, even tho Truvia has stevia in it, it is a bad substitute. You really have to check out the ingredients and processing procedures of the new sugar subs. I totally agree with you and did think of using Stevia alone, but found that most people didn’t like the taste. I don’t recommend you leave out sweetener entirely. If you don’t want to use Truvia (and I’m guessing you don’t want to use sugar either!) I suggest using 1 tablespoon of honey or maple syrup or Stevia to taste. It sseems that if the taste is not good, it is too much stevia. A combination should do the trick. I made it with sugar but used a little less, like 1.25 tbsp and it was really good. Surprisingly filling as it makes a decent sized “cake”. Love how quick and easy it is. Mug desserts are the BEST! Perfect portion control! Haha That looks so good! I know exactly what you mean, Liz! And when they’re single-serving, you get to eat the whole thing. Yay! Yum! This looks absolutely wonderful. I haven’t actually made a brownie in a mug before, but definitely want to now. Thanks so much, Tara! I can’t believe you’ve never made a brownie in a mug before. You need to try this asap! This version looks anything but small! IT looks so chocolatey and delicious! 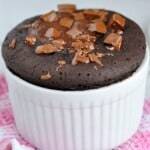 I love the way cocoa powder makes chocolate desserts super chocolatey! Thanks so much, Beth! And you’re right, the cocoa powder does make the chocolate flavour super deep and rich. Do you need to prepare the ramekin with vegetable spray before you add the batter? Just curious.